Activision Games For Girls Summit! You are here: Home / Great Deals / Christmas Deals / Activision Games For Girls Summit! Yesterday, I spent part of my day in Dallas at a fun event! 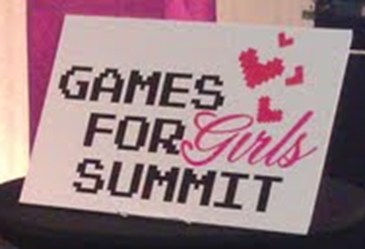 I was able to attend the Activision Games For Girls Summit! All of the games looked like a lot of fun. We learned a lot about video gaming in general. I was among the Moms in attendance that don’t limit video gaming time. I’ll tell you why. When my 26 year old son, was in kindergarten, his teacher said his small motor skills were not up to par. So, we happened to get a video game at that time and he loved playing it, before you knew it his small motor skills were great! So, I never limited my kids playing time. I also, know that Moms are worried about outdoor time. My kids LOVED video games, from the very beginning. They would play for hours – they also rode bikes, played basketball and kickball in the street for hours! I never had to tell my kids to turn it off and go outside, they loved and did both! There were two games that stuck out to me. One was the Lalaloopsy. I thought the fact that you could actually do crafts on it was really fun and unique. They showed making and decorating a tiara, you poured on glitter, just like you would on paper, and then had to use the microphone to blow off the excess glitter! That was pretty cool! Mittens Fluff ‘N’ Stuff, Blossom Flowerpot, Bea Spells a Lot and many more! game. Every doll’s environment and items will feel familiar to all Lalaloopsy fans. craft mini-game; giving the finished crafts as gifts unlocks even more accessories! content, coupled with delightful hidden collectibles, make the game engaging and exciting. 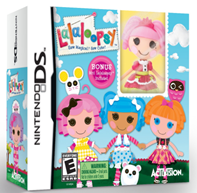 Also, each game comes with a limited edition mini Lalaloopsy doll! The other one I liked was the Wappy Dog. This is an actual robot dog, and it comes with a video game. It reminds me of the virtual pets you can feed and bathe and pet and love. But, they can do it on screen and off and the dog reacts to the care! So, when they are finished with the video game part of it, they have an actual toy to take away and carry with them until they are ready to go back to the game! We know girls love dolls and having one to take with them! This is perfect! simulation with the real world interaction of a physical companion. 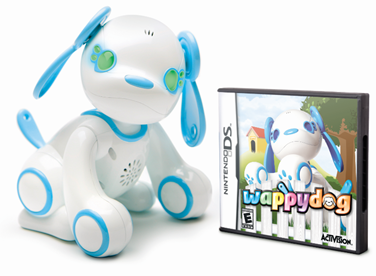 • Wappy Dog can sing several different songs but can be trained to learn up to 16 tunes as play continues. • More than 18 conversational prompts are answered with more than 350 evolving responses, with a “barked” response translated by the Nintendo DS software. So, when you are making that gift list – take a look at these games for girls, I was impressed!